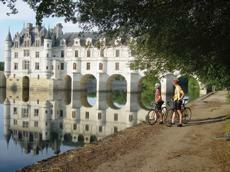 This is a 7 nights and 8 day cycling holiday in the Loire Valley in France. The tour starts on the bank of the Loire at Amboise, and has stop overs at Loches, Chenouceaux, Montbazon by the Indre, Azay-le-Rideau, Chinon and Saumur. Overnight stays are mainly in 2* Logis de France Hotels, normally with ensuite shower and WC, and is on a bed and breakfast basis throughout, with 5 evening meals included. The cycling is graded as Easy, as long rides are achievable due to the gently rolling terrain making cycling very easy and enjoyable. The maximum distance on an stage is 45km. Bike Hire is included in the price. Price includes a Euro currency surcharge of £40.66 (£8.12 on single supplement). Helmets are not included.